Sam Dolnick of The Times has a story today about a report due out today from the state Department of Transportation that may give cheer to south Bronx community advocates who want to eliminate the Sheridan Expressway (a prime route for truckers headed to the Hunts Point Market). 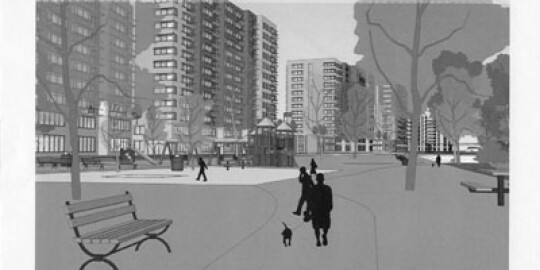 That would restore 13 acres of land that would give the community access to the Bronx River, connect it to other green space and allow the construction of affordable housing (see rendering above). The effort to de-map the Sheridan goes back a long way as the Hunts Point Express, a BxNN affiliate, has documented. For more on the Sheridan in the Express click here, here, here and here.